Our "White label" option gives you the opportunity to build a business selling tickets on behalf of other venues who don’t wish to sell tickets online themselves. The InterTicket system has in fact been specifically designed for operating a ticket selling portal including setting up multiple distributors or third party ticket sellers. Firstly you need to create a web site to introduce your business and what you offer. 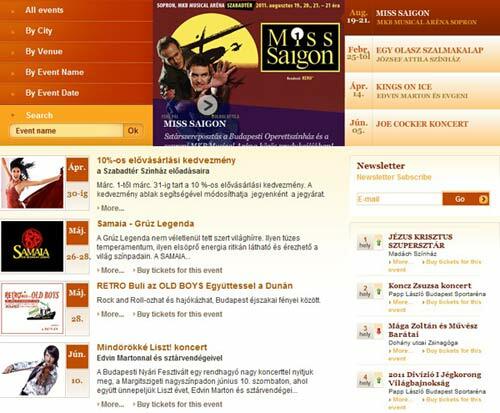 You would normally list selected events on your home page with brief details of the event. You link these events to the main ticketing page with a button or text saying e.g. "Buy tickets for this event". Your customers choose their seats, make their payment and are either issued with a link for PDF “print-at-home" tickets, a voucher for collection of tickets at a box office or nominated ticket outlet, or request the tickets to be posted to them (these are options you set). You would be responsible for entering all details of programs, events etc unless you wished to give the individual venues access to the system via a unique user name and password so they could enter their own program/event details. What would my web site look like? It's up to you what your web site actually looks like and what you wish to include on it. The main event search, seat selection and payment pages can be formatted to keep a similar look and feel as the remainder of your site with the same font types, color, size etc. You would probably include a search box and links to pages which sort events by venue, location, venue, event name and date as in the example below. How would I handle payments? You would need to set up your own Payment Gateway and Merchant Account so that all ticket revenue was deposited directly into your account. You would then transfer the relevant ticket sales revenue to your clients (less your charges and fees) on an agreed schedule. The system can print detailed reports showing sales by venue, program etc for specific time intervals. Can each venue also sell tickets themselves though the system? Certainly! You just need to set them up as "Network Users" with their own username and log in which gives them the ability to sell tickets to their events only. If they wish, they can effectively use the system interface as their box office, taking either cash or credit card payments and selling tickets either off the seating chart or by the quicker "best available" method and (optionally) printing tickets at the same time. All sales are recorded in the system so you can apply any fees to these sales as you wish. Can I appoint ticket resellers or agents? The InterTicket system is specifically designed to handle any number of resellers or agents and keep track of all commission or discounts offered. You can both allocate tickets to resellers or give them access to the network where they can enter credit card details and print tickets directly from their remote location. InterTicket can record deposits made by resellers, issue receipts, and automatically charge resellers for unsold tickets which have not been returned by a specific date. How would I charge my clients? You can choose to charge your clients a percentage fee, or if you wish, an additional per ticket charge or monthly service fee. You can also apply separate fees for internet transactions if you wish. There are no additional charges to use our system as a portal type of operation. The only cost is the 2.0-2.5% charge on all tickets sold through the system (depending on ticket volume) and any charges associated with preparing seating charts. Please contact us if you require further clarification or assistance in setting up a ticketing portal.